A little over fourteen years ago I held a four-week-old jet black puppy in my hands, the runt of a litter about to be loaded into a car with mother dog to be taken to the pound. I could not save them all but I did save the little one. I named that bundle of canine joy, Tidbit, as she represented just a wee bit of the big picture of life. How little did I know then that my dog Tidbit would be the light of my life from that moment on. She would be my best friend, my protector, and the canine mate of my soul. Tidbit would also bring further joy into my life with her daughter dogs: Scratch, from her first litter and NewBe, from her second. 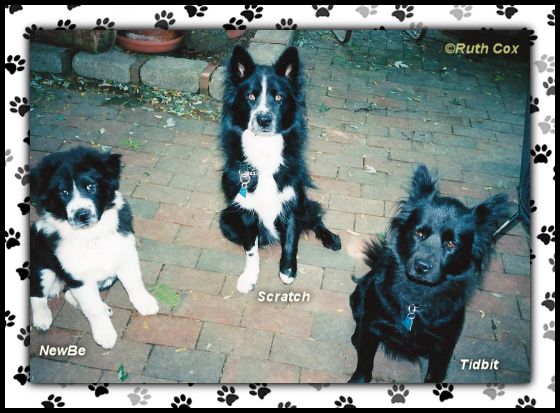 The paw prints you shall see on our banners are those of NewBe and Scratch, with Tidbit's imprint being a part of the blog's name. Eventually I will share our journey together with you and the many paths upon which our lives would take us, together and alone. Along the way I shall share the tidbits of life lessons and other things I have learned while having these girls as my companions. For today, I just wish to introduce you to the paw prints upon this brand new blog and let you know that Dog Positive Tidbits will be coming your way, so that you, too, may learn to live life to its fullest—from the perspective of a dog's life. We choose to announce this positive project today because it is our paw print for National Dog Day. We trust that all dogs and dog lovers are enjoying this special day for man's best friend.